Comprehensive review of Aqua Tan Self Tanning Body Milk. See what real experts and actual users have to say about this self tanning product. This week I reviewed Aqua Tan Self Tanning Body Milk. I gave this one 2 out of 5 stars because there were some things I really didn’t like. First off, the smell is horrific… all I could smell is self tanner. Second, the price point is way too high. And third, my tan was so, so light. The one thing I did like was how quickly it dried, and how easy it was to apply. I just don’t think this one is worth the price tag. Aqua Tan Self Tanning Body Milk, actually looks a lot like milk. It comes out as a creamy, white lotion thats pretty watery. It’s very thin and lightweight. This one was very easy to apply, except it was kind of watery. So be careful when applying it, it could drip and get a little messy. The good news is if it gets somewhere, there’s no guide so it’s easy to clean up. I wore gloves when applying this one, but I don’t think you need to. It was very easy to blend in and felt very slick. This one dried really fast, which I was excited about. It dried in under 15 minutes, and after it dried my skin felt silky smooth. I think it dried so fast because the product was so thin. Yuck is all I can say about the way this one smells! It smells like straight DHA, it’s not pleasant at all. All I could smell is self tanner, no fragrance or scent. When I woke up the next morning I could still smell DHA on my skin, I couldn’t wait to shower it off! Aqua Tan Self Tanning Body Milk produced a light shade tan. The color was very smooth and even, but it was almost nonexistent it was so light. Someone actually commented on how pale I looked….that’s not what you want to hear after using a self tanner. I wish the color would’ve been at least a medium shade. This is more of a gradual tanner that you’ll have to apply daily to maintain a tan. This one didn’t last very long, maybe 1-2 days. You’ll have to apply it daily to maintain your tan. As it faded it didn’t become splotchy or scaly which was good. It’s very expensive for what you get, and it smells really bad. You’ll have to apply it daily to maintain a light-medium shade tan. That’s a lot of work for a sub par product if you ask me. 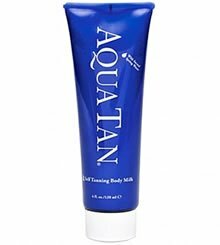 Aqua Tan Self Tanning Body Milk runs $10.50 an ounce, which is very pricey. Plus you’ll have to pay an extra $7.50 to ship it to you. The whole bottle is $42.00, which is way too much for this product. To buy Aqua Tan Self Tanning Body Milk, Click Here. Application Application is simple, but the product is a little thin. Drying Time It took under 15 minutes to dry which was awesome. Smell (After) I could still smell DHA the next morning before I showered it off. Color Produced It produces a super light tan, it’s more of a gradual tanner. How Long It Lasts Lasted around 1-2 days, you’ll have to apply this one daily to see color. OK For Men? No, it’s way too pricey for a smelly, light tan. Price $10.50 an ounce, talk about expensive! !